The freshness and magic of snow directly transported to your home with the gracious Mrs Snowman from Hoptimist. Imagine being able to have a snowman in the house that does not melt from the heat of the fireplace and is always there ready to play with and make you smile. 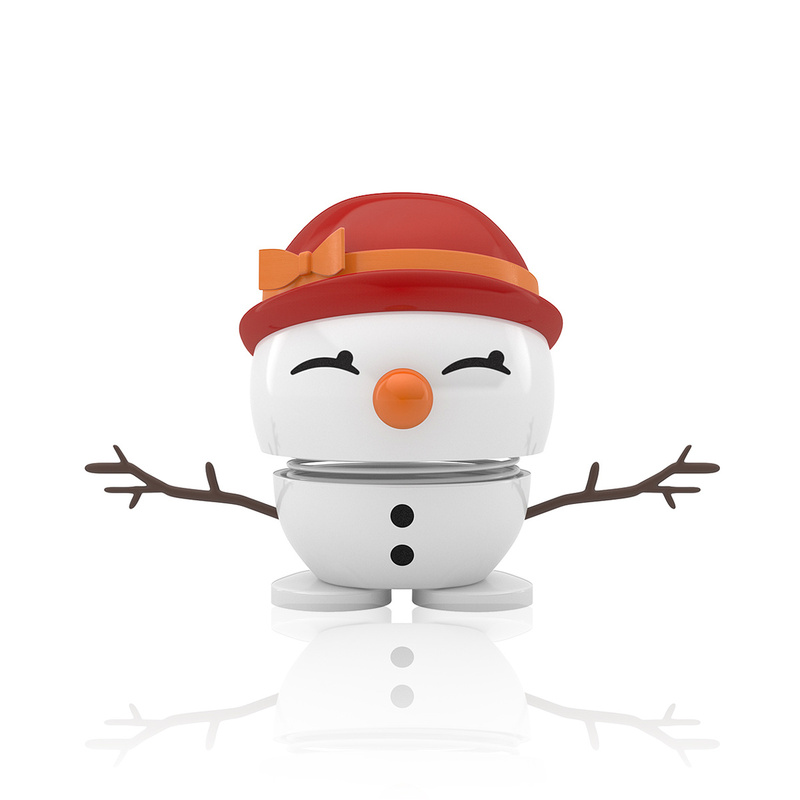 Hoptimist was able to make this dream come true by creating the fun Mrs Snowman. Mrs Snowman is a nice white plastic ball at the centre of which is positioned a small spring that separates the upper part from the lower one, thus bringing about the head and body of a beautiful snowman. The face features an orange nose and two cute, lively eyes that draw attention from both the young and old and coerce a smile, on this beautiful face dominated by a black, elegant cylinder, placed a little bit sideways to greet the viewer. The arms are two small brown branches, worthy of a snowman, the "suit" consists of two simple round buttons and the bottom features two cute and funny feet sticking out. There is also a more feminine version for this household decoration, very similar in shape but with a colourful hat with ribbon and bow. Hoptimist's Mrs Snowman is certainly a very original and cute idea for decorating the house during the holiday season, it can be placed in the kitchen, living room or in the children's room to amuse them and give them a little holiday joy and cheer, but it can also be a great gift idea so as to avoid giving friends and family socks or scarves. 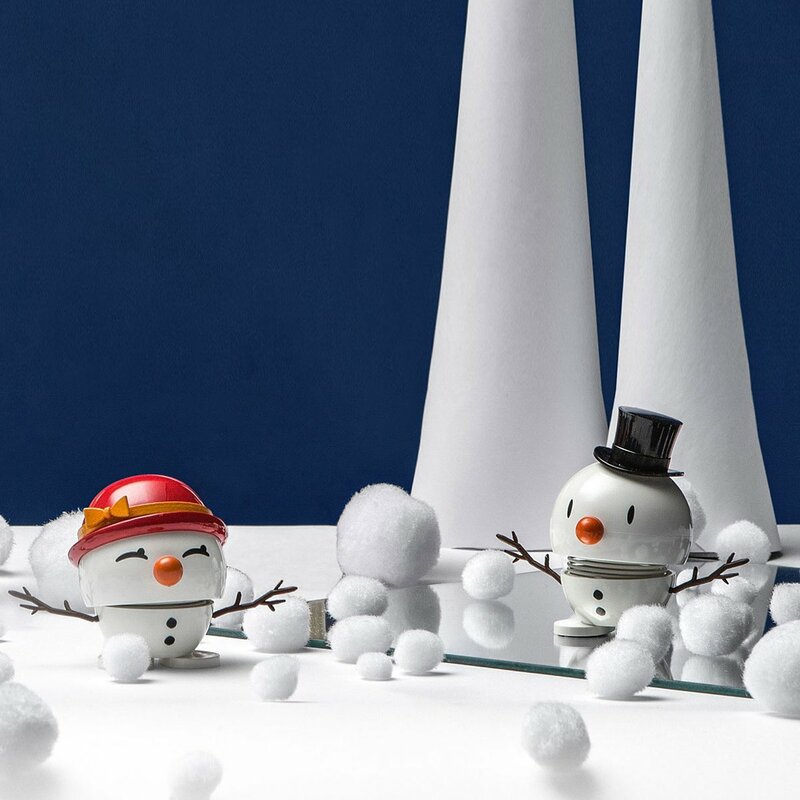 Choosing Mrs Snowman as a gift is certainly an original and playful idea because it not only serves as holiday decoration but also has its own peculiarities and a design that makes it recognizable and special at first glance. The Hoptimist brand always wants to brighten its customers' homes and Mrs Snowman hits the mark.